Whether you’re new to the software development game or been a player for years, chances are you’ve participated in a sprint retrospective. If done well, these agile meetings can highlight opportunities for change, generate meaningful process improvements, and ultimately move the team in the right direction. If done poorly, a sprint retrospective can turn into a blame game or give some of the loudest voices a platform to gripe about something happening in the project, without suggestions to make things better. (Spoiler alert: that’s not how they should go). Keep reading if you want to understand how you can use the sprint retrospective as a vehicle to drive change. We’ll break down what it is, what it isn’t, and hash through some helpful tips to make the sprint retrospective as productive as possible. By definition, a retrospective allows you to look back on past events or situations. According to the Scrum Guide, the sprint retrospective is an “opportunity for the Scrum Team to inspect itself and create a plan for improvements to be enacted during the next Sprint.” Makes sense, especially since the focus of agile development is continuous improvement. In order to get better, you have to know which sword to sharpen. The retrospective should create a safe space for people to share their honest feedback on what’s going well, what could be improved, and generate a discussion around things that should change next time around — with actionable items documented. Retrospectives can be used for any type of team working on a shared project, but the sprint retrospective is especially optimized for an agile production team. It is one of the ceremonies that Scrum and Kanban teams leverage throughout cyclical product development. What’s great about the retrospective is that it happens right as a sprint closes, meaning fresh ideas are usually top of mind and able to be teased out by the whole team. We’ll dig into how this differs from a sprint review later, but the main point to remember is that it all boils down to continuous improvement. The purpose of the sprint retrospective is to drive positive change in the project, the team, the account, and potentially the organization. Why Should You Run A Sprint Retrospective? If you’re practicing some sort of agile methodology, chances are the sprint retrospective is already a part of your routine. Ironically, routine might be an issue that some production teams face. Often times, teams can fall into their rhythm, and vital ceremonies like the sprint retrospective can become so run-of-the-mill that teams aren’t using them to their intended advantage. Rest assured, we’ll dive into some ways to mix things up later on. It creates a safe, blameless space for team members to share their valuable feedback.It allows the team to document wins and areas of opportunity.It provides an actionable list of next steps and identifies who’s owning which item.It identifies small, incremental changes that can lead to larger waves of improvement.It allows teams to iterate on their process to amplify results.It allows opinions to be heard.It helps the team mature.It makes each sprint better than the last. What’s The Difference Between A Sprint Review And A Sprint Retrospective? Both the sprint review and the sprint retrospective are scrum ceremonies used around the world by production teams. While similar — in that they both take place at the end of the sprint — they are separate and distinct exercises and should always be treated as such. The sprint review creates an opportunity for the team to showcase the work that has just been completed in the latest sprint. This can be more casual in nature, where a demo of the work is presented to internal team members. It can also be a more formal meeting, where stakeholders outside of the core team can be invited to a showcase. Regardless of how fancy you want (or need) to make the sprint review, the work should always be fully demonstrable and meet the team’s defined quality in order to be reviewed. So it’s said, the team is allowed to celebrate their accomplishments and get immediate feedback from sprint review attendees during this meeting. Once the sprint review is over, the sprint retrospective typically takes place. This is where the team reflects on the work they just completed, offers up kudos to what went well, and identifies suggestions for improvement moving forward. It should be action-oriented, blameless, and adapted to fit your team’s needs. It is typically facilitated by the Scrum Master or DPM. Folks on the periphery of the project do not need to — and should not — join. To put it plainly, the sprint review is about demoing the work that was just completed, and the sprint retrospective is about identifying areas of improvement to make the next sprint better. A somewhat important sidebar is that all of these ceremonies should be timeboxed appropriately. There are a lot of resources, like this one and this one, available that break timeboxing down a bit more, but in essence, all ceremonies should have strict time boundaries. This helps to ensure the most important topics are addressed in each ceremony. Timeboxing also helps to reduce unnecessary time spent in agile meetings and creates a more efficient development process. I’m pretty sure that’s something we can all appreciate. Note that timeboxing does depend on the length of the sprint. Let’s take a two-week sprint for example. The sprint review should last a maximum of 2 hours. After that, the sprint retrospective should only last 90 minutes tops. It may be tempting to extend these, but you will likely experience diminishing return. Keep them timeboxed and focused! If the same questions are asked sprint after sprint after sprint, team members can become less engaged in the answers and stop offering up constructive suggestions to improve the process. Combat apathetic participation by mixing things up! The outcomes of a good retrospective can be reached by adapting different exercises and questions. There is no “one ring to rule them all” when it comes to retrospectives for a reason — you should iterate on the way you run this. Check out some good inspiration here, here and here. At the end of the day, we are people. And people have emotions. We are also not perfect creatures. Retrospectives should invite constructive feedback on what could go better in future sprints, but it should never support hostility, baseless negativity, and finger-pointing. It’s vital for DPMs and CSMs to be non-judgemental and unbiased facilitators during the retrospective meeting. People should feel safe to share their feedback in this meeting. Be sure to set expectations when you kick off the sprint retrospective, mediate along the way when necessary, and promote a positive conversation. You might have a sprint retrospective where it feels like questions are met with blank stares. Instead of pulling teeth to get the conversation going, come up with a more engaging opening to the meeting, and treat it like the great opportunity to drive incremental change that it is. Aside from that, you can encourage your team to write their suggestions and thoughts down throughout the course of a sprint. This will give them something to look at during the retrospective instead of feeling like they need to pull anything out of thin air. Alternatively, you can also consider keeping a log of these yourself (things heard throughout the week, in other agile meetings or during standups). This is a fun one. Sometimes, action items identified in the retrospective impact members outside of the production team. Whoever is owning that item should be working with leadership to develop a conversation around the suggestion and detail ways to make the requested change. It is possible, however, that leadership will be resistant to the suggestion. If that is the case, keep at it. Find your champions within the organization who will go to bat for the production team and the improvements that stem beyond them. An agile company and/or one that values positive change should eventually be willing and open to implementing process improvements that benefit the team at large. Be sure to frame any recommendations in a way that doesn’t single anyone out or cause undue stress. This is what you want to strive for! Sprint retrospectives can be a ceremony that people look forward to most because it should create a space to assess how process improvements have gone and allow for more suggestions to follow. Strive for participation by offering up gratitude when team members really dive into the conversation. Be thankful to those who use this time to make meaningful contributions. Be positive. What Might The Team Think? As I set out to write this article, I reached out to several team members in the organization to chat about their experiences with sprint retrospectives. I was curious to find out what different roles (designer, developer, and product manager) thought about this ceremony. If you’re just getting started with retrospectives or looking to mix things up, talking directly with team members can be a good place to start. I asked them three simple questions. 1. If Run Well, What Can A Sprint Retrospectives Provide You? 2. If Run Poorly, What Can Happen? 3. Do You Have A Favorite Question Or Activity That’s Been Asked In A Sprint Retrospective? At the end of the day, it comes down to brass tacks. 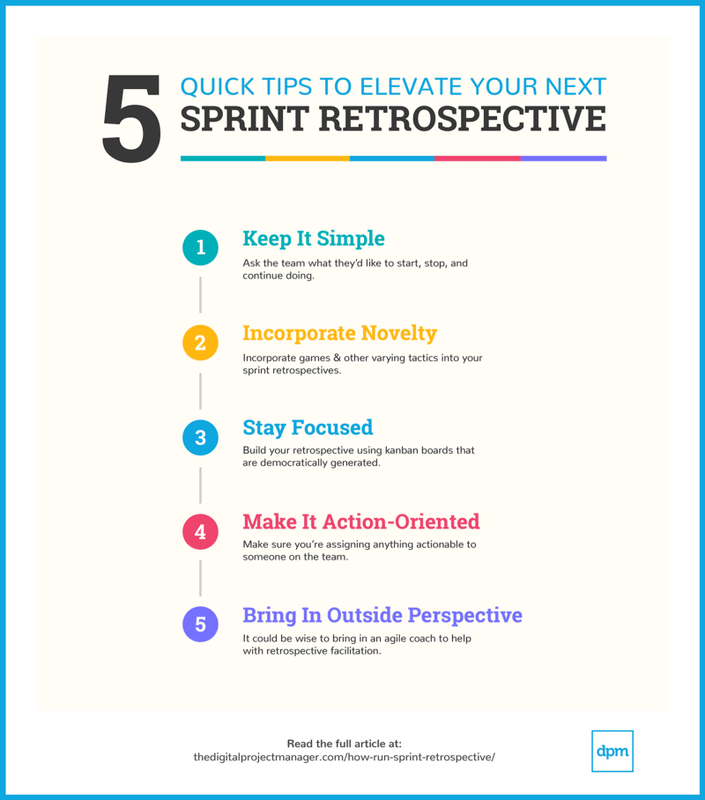 If you’re looking for some sprint retrospective ideas to make your next one more effective, keep reading. Whether you’re stuck in a rut with the same old questions, looking to mix things up, or planning to roll out the sprint retrospective process to your team, here are some sprint retrospective examples to get your juices flowing. I credit the great team at Mountain Goat Software for this suggestion, but a simple way to make your next sprint retrospective effective is to ask the team what they’d like to start, stop, and continue doing. For instance, the team may identify that they want to start writing test cases at the time of user story creation. They may decide to stop going over the 15 recommended minutes for daily standups, and they decide to continue experimenting with a new tool that hasn’t become a habit yet. Regardless of the decisions, make sure you’re asking for mass participation, documenting the suggestions you’re hearing, and vote to determine what happens. Another technique is to incorporate games & other varying tactics into your sprint retrospectives. There are a lot of examples out there. Pick one that makes the most sense for your team or project stage, and be sure to run through it at least once beforehand so you’re familiar. These can be fun, effective, and productive but only when the facilitator is prepared! One of my favorites is the LEGO Retrospective. In this sprint retrospective example, team members are encouraged to use the LEGO blocks to build a structure that represents the last sprint, and one that represents what needs to happen to improve the next one. This abstracts things a little bit and generates some surprisingly productive (and creative) conversations. Using the Lean Coffee approach, retrospective agendas can be built using kanban boards that are democratically generated. This might be good for a group who can’t seem to stay on topic or who tend to spend too much time on a particular discussion point. Be sure to use different colored sticky notes and markers and identify a volunteer to document outcomes. Most simply, but perhaps most importantly, make sure you’re assigning anything actionable to someone on the team. They don’t all need to fall on the product manager. In fact, they shouldn’t. The conversation can be as constructive and helpful as possible, but the ripples will not be felt unless the change is implemented across the team. Keep a list visible for everyone to see, and make sure that expectations and deadlines are set. If you’re looking for some backup, it could be wise to bring in an agile coach to help with retrospective facilitation. There are a lot of experts out there who can tease out some of the finer points of the conversation and help to drive change for the team. An outside perspective can be a huge turning point! This may come at a premium (and may not be required unless there are significant struggles), so another great solution would be to invite another teammate to the conversation. Those unrelated to the project can help shed a light on the important comments and act as a neutral third-party. Modern agile preaches that we ought to experiment and learn during projects. The sprint retrospective is undoubtedly a great vehicle to collect, discuss, and ultimately implement these learnings. I can’t think of one DPM who doesn’t want to call their project successful. To that end, use the sprint retrospective to drive that change and fortify your processes to make each project a win. Originally published at thedigitalprojectmanager.com on March 13, 2018.